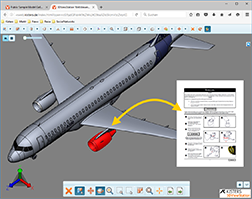 Easily overcome complexity of CAD data with 3DViewStation WebViewer for real time visualization. SACRAMENTO, CA 3DViewStation WebViewer announced as the perfect 3D CAD visualization tool for web-based service applications. Today’s service applications need to be able to load variants and configurations of complex products dynamically and fast. Associated information should be at your fingertips. Service and maintenance instructions of interest need to be accessible by hyperlinks, or a single click on the related geometry. The fact that the complexity of CAD data is growing more and more requires a smart concept to achieve visualization in real time. Also the support of mobile devices with limited bandwidth is a challenge. To serve all these scenarios KISTERS has developed 3DViewStation WebViewer. No client installation is required. It is extremely fast -- even with assemblies of 100.000+ parts -- and it is designed for integration. If needed, it can be easily customized to be integrated with the UI of the leading application. The XML-API allows dynamic un-/loading of parts and assemblies; geometries may be highlighted or re-colored; sections can be performed; and measurements can be taken. 3DViewStation WebViewer also enables hyperlinks from geometry to associated 3D models or 2D documents, which is essential to guide a user directly to the correct service and maintenance instructions. KISTERS' 3DViewStation WebViewer only requires a HTML5 browser. It does NOT require WebGL. It runs on all operating systems including Windows, iOS, Android, Linux, MAC-OS. Your intellectual property is protected all the time. Visit the 3DViewStation blog and YouTube channel for updates. KISTERS' 3DViewStation is developed by very closely following customer requirements. The versions available are Desktop, ActiveX and HTML5 WebViewer. All product offerings are intended for use with a PLM-, ERP- or other management system like product configuration or service and spare part applications. For cloud, portal and web-solutions, a HTML5-based WebViewer solution is available; it does not require any client installation. All file formats can be used in combination with intelligent navigation and hyperlinking features to address various needs of complex integration scenarios. KISTERS is a multinational IT company, founded in 1963 as an engineering agency. Its 500+ employees develop resource management systems for energy, water and air, and information systems in the area of environment protection and safety. With more than 3,000 customers and more than 150,000 installed licenses, KISTERS is an internationally sought after partner for software solutions. One core focus of the IT solutions department is the development and sale of visualization solutions for CAD data and documents, including ECM and PLM integrations. KISTERS is known and valued in the marketplace for its professional competence, operational experience and customized solutions.